Zagreb is unbearably hot these days. School isn't over yet. We've just started a makeover of our condo. What a summer! Somehow I don't feel like writing about my trips, especially because I'm not going anywhere this summer. Okay, okay, I'm going to the seaside, to the island of Krk later next month, but I'm not traveling abroad. People travel so much in the summer that we wouldn't stand a chance to board a plane as stand-by passengers. On the one hand it's good, because all popular destinations are overcrowded at that time, but on the other, I feel sorry for not being able to explore other countries. But I know we'll make up for it in the fall and winter, our travel seasons. 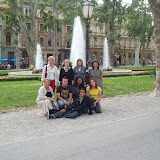 After visiting Dubrovnik, the pearl of the Adriatic, we all arrived in Zagreb, our hometown. Perhaps the fact that our American guests had the opportunity to live and work/go to school in the Croatian way and because this is where our home is, i.e. 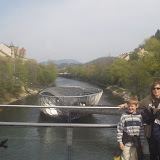 our family and friends, was the reason they liked Zagreb more than Dubrovnik. As they said, Dubrovnik is more traditional, Zagreb is more modern - and besides, they went clubbing, which is actually impossible in the States, being less than 21. 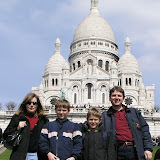 Our American guests, one teacher and two students, arrived in Europe on May 29. They flew to Paris where they spent the first three days, then took an overnight train to Florence, stayed there for another two days, then on to Rome from where they flew to Dubrovnik, via Vienna. 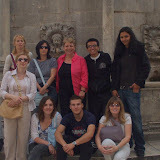 Four Croatian teachers and two students who were to host their American peers, met them at Dubrovnik Airport. Together we all went to the Youth Hostel, which was excellent, with delicious food, clean rooms and bathrooms (although not en suite) and very helpful and kind staff, especially the cooks.